I'm not particularly confident. Scratch that. I'm situationally confident: sometimes, very much so; other times, not at all. So I spend a lot of time thinking about how to gain confidence. And that makes me wonder. In a world of "fake it till you make it," how can you tell when someone is truly confident--in his or her ideas, plans, and self--and, just as important, that the person's confidence is justified? Better yet, how do you know when your sense of self-confidence is justified? Unfortunately, I don't have the answer, so I asked Dharmesh Shah, co-founder of HubSpot and a guy who has met hundreds of entrepreneurs and invested in a number of startups, how he spots truly confident people. Keep in mind confidence is not bravado, or swagger, or an overt pretense of bravery. Confidence is not some bold or brash air of self-belief directed at others. Confidence is quiet. Confidence is a natural expression of ability, expertise, and self-regard. I'm fortunate to know a number of truly confident people. Many work with me at HubSpot, while others are fellow founders of their own startups, some of whom I've met through my angel investment activity. But the majority are people I've met through my career and who work in a variety of industries and professions. 1. They take a stand not because they think they are always right, but because they are not afraid to be wrong. Cocky and conceited people tend to take a position and then proclaim, bluster, and totally disregard differing opinions or points of view. They know they're right--and they want (actually, they need) you to know it, too. Their behavior isn't a sign of confidence, though; it's the hallmark of an intellectual bully. Truly confident people don't mind being proved wrong. They feel finding out what is right is a lot more important than being right. And when they're wrong, they're secure enough to back down graciously. Truly confident people often admit they are wrong or don't have all the answers; intellectual bullies never do. 2. They listen 10 times more than they speak. Bragging is a mask for insecurity. 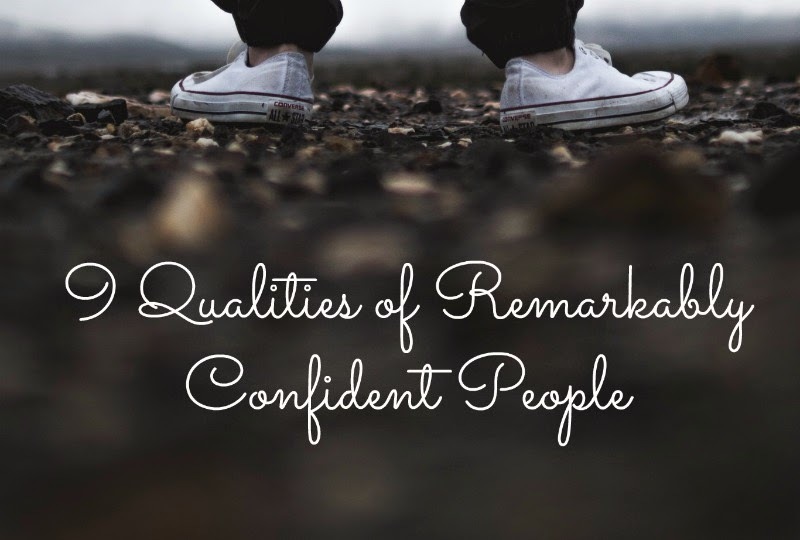 Truly confident people are quiet and unassuming. They already know what they think; they want to know what you think. So they ask open-ended questions that give other people the freedom to be thoughtful and introspective: They ask what you do, how you do it, what you like about it, what you learned from it, and what they should do if they find themselves in a similar situation. Truly confident people realize they know a lot, but they wish they knew more, and they know the only way to learn more is to listen more. 3. They duck the spotlight so it shines on others. Perhaps it's true they did the bulk of the work. Perhaps they really did overcome the major obstacles. Perhaps it's true they turned a collection of disparate individuals into an incredibly high-performance team. Truly confident people don't care--at least they don't show it. (Inside they're proud, as well they should be.) Truly confident people don't need the glory; they know what they've achieved. They don't need the validation of others, because true validation comes from within. So they stand back and celebrate their accomplishments through others. They stand back and let others shine--a confidence boost that helps those people become truly confident, too. 4. They freely ask for help. Many people feel asking for help is a sign of weakness; implicit in the request is a lack of knowledge, skill, or experience. Confident people are secure enough to admit a weakness. So they often ask others for help, not only because they are secure enough to admit they need help but also because they know that when they seek help they pay the person they ask a huge compliment. Saying "Can you help me?" shows tremendous respect for that individual's expertise and judgment. Otherwise, you wouldn't ask. 5. They think, "Why not me?" Many people feel they have to wait: to be promoted, to be hired, to be selected, to be chosen--like the old Hollywood cliché, to somehow be discovered. Truly confident people know that access is almost universal. They can connect with almost anyone through social media. (Everyone you know knows someone you should know.) They know they can attract their own funding, create their own products, build their own relationships and networks, choose their own path--they can choose to follow whatever course they wish. And very quietly, without calling attention to themselves, they go out and do it. 6. They don't put down other people. Generally speaking, the people who like to gossip, who like to speak badly of others, do so because they hope by comparison to make themselves look better. The only comparison a truly confident person makes is to the person she was yesterday--and to the person she hopes to someday become. 8. ...And they own their mistakes. Insecurity tends to breed artificiality; confidence breeds sincerity and honesty. That's why truly confident people admit their mistakes. They dine out on their screwups. They don't mind serving as a cautionary tale. They don't mind being a source of laughter--for others and for themselves. When you're truly confident, you don't mind occasionally "looking bad." You realize that that when you're genuine and unpretentious, people don't laugh at you. They laugh with you. 9. They seek approval only from the people who really matter. You say you have 10,000 Twitter followers? Swell. 20,000 Facebook friends? Cool. A professional and social network of hundreds or even thousands? That's great. But that also pales in comparison to earning the trust and respect of the few people in your life who truly matter. When you earn their trust and respect, no matter where you go or what you try, you do it with true confidence....because you know the people who truly matter the most are truly behind you.